My guest today has fallen in love with growing native plants. Joining us is Aubree Keurajian who has just recently started her own native plant nursery in Conneticut called "Ungardening." Aubree wants to share her love of native plants with her community in an attempt to foster a better, more evolved concept of environmental stewardship through gardening. I think it is safe to say that the world needs more people like Aubree. Enjoy this audio celebration of the glory of native plants. This episode was produced in part by Carly, Stephen, Botanical Tours, Moonwort Studios, Lisa, Liba, Lucas, Mohsin Kazmi Takes Pictures, doeg, Daniel, Clifton, Stephanie, Rachelle, Benjamin, Eli, Rachael, Anthony, Plant By Design, Philip, Brent, Ron, Tim, Homestead Brooklyn, Brodie, Kevin, Sophia, Brian, Mark, Rens, Bendix, Irene, Holly, Mountain Misery Farms, Caitlin, Manuel, Jennifer, Sara, and Margie. When Joey Santore went searching for a biological "origin story" of sorts, he stumbled into the world of botany. He hasn't looked back ever since. As a fellow phyto-obsessive personality, Joey is dedicating most of his spare time to not only understanding plant diversity but also sharing his passion for botany with the world. Joey runs probably my favorite Instagram page https://bit.ly/2z6n3By and his stories are as educational as they are insightful and entertaining. Join us for a botanically enthused conversation about our mutual love for plants. Be warned, strong language contained within this recording! This episode was produced in part by Carly, Stephen, Botanical Tours, Moonwort Studios, Lisa, Liba, Lucas, Mohsin Kazmi Takes Pictures, doeg, Daniel, Clifton, Stephanie, Rachelle, Benjamin, Eli, Rachael, Anthony, Plant By Design, Philip, Brent, Ron, Tim, Homestead Brooklyn, Brodie, Kevin, Sophia, Brian, Mark, Rens, Bendix, Irene, Holly, Mountain Misery Farms, Caitlin, Manuel, Jennifer, Sara, and Margie. As far as native bees are concerned, we still don't know very much. That desperately needs to change as we gain a better understand of the role these wonderful insects play in ecosystem function and health. Luckily there are people like Dr. Rebecca Tonietto. Her work on native bee diversity in urban landscapes is helping to revolutionize our understanding of biodiversity in these human dominated systems. Her work is inspiring to say the least and its something I think everyone needs to consider as we move further into a human dominated future. This episode was produced in part by Stephen, Botanical Tours, Moonwort Studios, Lisa, Liba, Lucas, Mohsin Kazmi Takes Pictures, doeg, Daniel, Clifton, Stephanie, Rachelle, Benjamin, Eli, Rachael, Anthony, Plant By Design, Philip, Brent, Ron, Tim, Homestead Brooklyn, Brodie, Kevin, Sophia, Brian, Mark, Rens, Bendix, Irene, Holly, Mountain Misery Farms, Caitlin, Manuel, Jennifer, Sara, and Margie. Join University of Vienna PhD student Florian Etl for an in depth look at a pollination system involving some of our most beloved houseplants. Florian focuses on genera like Philodendron, Anthurium, Dieffenbachia, and Spathiphyllum to shine light on how the plants manage to reproduce in the hyper diverse rainforests of Costa Rica. This is not easy work by any means but Florian and his colleagues are finding out new and wonderful things about the natural world. This is one episode you do not want to miss. This episode was produced in part by Letícia, Ron, Tim, Carl, Lisa, Susanna, Homestead Brooklyn, Daniella, Brodie, Kevin, Katherina, Sami & Sven, Sophia, Plant by Design, Mark, Rens, Mountain Misery Farms, Bendix, Irene, Holly, Clifton, Shane, Caitlin, Rosanna, Mary Jane, Manuel, Jennifer, Sara, and Margie. Join Dr. Mark Whitten and me as we explore a lowland tropical forest in Costa Rica. I have never experienced such a warm, humid forest environment before and I met so many new and familiar plant species along the way. This is a great one for the senses as we immerse ourselves in the sights and sounds of the understory. This episode was produced in part by Letícia, Ron, Tim, Carl, Lisa, Susanna, Homestead Brooklyn, Daniella, Brodie, Kevin, Katherina, Sami & Sven, Sophia, Plant by Design, Mark, Rens, Mountain Misery Farms, Bendix, Irene, Holly, Clifton, Shane, Caitlin, Rosanna, Mary Jane, Manuel, Jennifer, Sara, and Margie. For Dr. Rob Raguso, the phrase "stop and smell the roses" takes on a whole new meaning. Dr. Raguso studies the intricate world of floral chemistry. You are undoubtedly familiar with some of the wonderful odors flowers produce but such tantalizing smells are only the beginning. The world of floral chemistry is quite remarkable and the function of the myriad substances they produce go much deeper than simply pollination. This conversation will put a whole new spin on your appreciation of flowering plants. This episode was produced in part by Letícia, Ron, Tim, Carl, Lisa, Susanna, Homestead Brooklyn, Daniella, Brodie, Kevin, Katherina, Sami & Sven, Sophia, Plant by Design, Mark, Rens, Mountain Misery Farms, Bendix, Irene, Holly, Clifton, Shane, Caitlin, Rosanna, Mary Jane, Manuel, Jennifer, Sara, and Margie. My guest today is plant breeder, horticulturist, and botanical explorer Dr. Peter Zale. As part of the research staff at Longwood Gardens, Dr. Zale is utilizing his expertise to put plants in the spotlight. From exploring tropical jungles to propagating endangered orchids, Longwood Gardens is at the forefront of botanical education. Join us for a glimpse at what is going on at Longwood Gardens. This episode was produced in part by Ron, Tim, Carl, Lisa, Susanna, Homestead Brooklyn, Daniella, Brodie, Kevin, Katherina, Sami & Sven, Sophia, Plant by Design, Mark, Rens, Mountain Misery Farms, Bendix, Irene, Holly, Clifton, Shane, Caitlin, Rosanna, Mary Jane, Manuel, Jennifer, Sara, Sienna & Garth, Troy, and Margie. Plants, being sessile organisms, must go to great lengths to protect themselves from herbivores. Sometimes this takes the form of spines or thorns, sometimes its nasty chemicals, and sometimes it means recruiting ants as bodyguards. Peter Marting is my guest today and he studies how one group of tropical trees in the genus Cecropia recruits and houses ants and how the interaction between these two different organisms influences the collective personality of the ant colonies. This episode was produced in part by Tim, Lisa, Susanna, Homestead Brooklyn, Daniella, Brodie, Kevin, Katherina, Sami & Sven, Sophia, Plant by Design, Mark, Rens, Mountain Misery Farms, Bendix, Irene, Holly, Clifton, Shane, Caitlin, Rosanna, Mary Jane, Manuel, Jennifer, Sara, Sienna & Garth, Troy, and Margie. There are far too many plants in this world that get little to no attention. Such is the case for a group of milkweed relatives in the genus Chthamalia. Luckily for these plants, a chance encounter by Dr. Angela McDonnell led to a wonderful world of discovery. From describing new species to understanding the evolution of this amazing group, Dr. McDonnell has opened our eyes to the wonders of the genus Chthamalia. Join us for a fun discussion about her love for plants and their evolution. The episode was produced in part by Lisa, Susanna, Homestead Brooklyn, Daniella, Brodie, Kevin, Katherina, Sami & Sven, Sophia, Plant by Design, Mark, Rens, Bendix, Irene, Holly, Clifton, Shane, Caitlin, Rosanna, Mary Jane, Manuel, Jennifer, Sara, Sienna & Garth, Troy, Margie, and Laura. Today we are joined by two of my favorite people - expert horticulturist Dave Janas (ep's. 15, 33, and 34) and restoration ecologist Estefania Fernandez (ep. 95) - to talk about their botany-fueled trip to Bolivia. One can only imagine what a country like Bolivia holds for botanically minded folks like these. From the high elevation Andes to the humid portions of lowland Amazonia, we discuss some of their experiences exploring this beautiful country. This episode was produced in part by Homestead Brooklyn, Daniella, Brodie, Kevin, Katherina, Sami & Sven, Sophia, Plant by Design, Mark, Rens, Bendix, Irene, Holly, Clifton, Shane, Caitlin, Rosanna, Mary Jane, Manuel, Jennifer, Sara, Sienna & Garth, Troy, Margie, and Laura. Impatiens is the largest of two genera in the family Balsaminaceae. Its myriad species hail from a variety of habitats and exhibit a multitude of interesting growth habits. Join me and my guest Mr. Impatiens as we discuss the wonders of this beautiful genus of plants. From growing them to conserving them, this is your introduction to Impatiens. This episode was produced in part by Daniella, Brodie, Kevin, Katherina, Sami & Sven, Sophia, Plant by Design, Mark, Rens, Bendix, Irene, Holly, Clifton, Shane, Caitlin, Rosanna, Mary Jane, Manuel, Jennifer, Sara, Sienna & Garth, Troy, Margie, and Laura. Despite representing nearly half of the tropical forests around the globe, tropical dry forest ecosystems have largely been overshadowed by rainforests. Sadly, most attention that has been paid to these diverse ecosystems has come in the form of agriculture. As such, the world has lost much of its old growth tropical dry forests. How these forests recover from such disturbance and how they are going to persist in the face of climate change are just some of the questions Dr. Jennifer Powers is trying to answer. Join us for a wonderful conversation about some of the most poorly understood ecosystems on our planet. This episode was produced in part by Daniella, Brodie, Kevin, Katherina, Sami & Sven, Sophia, Plants by Design, Mark, Rens, Bendix, Irene, Holly, Clifton, Shane, Caitlin, Rosanna, Mary Jane, Manuel, Jennifer, Sara, Sienna & Garth, Troy, Margie, and Laura. It is hard to wrap your head around the floristic diversity of places like Southeast Asia. Indeed, it is one of the most biodiverse regions of the world. The challenges and excitement of cataloguing the myriad plant species that call this region home are what drive Kew's Head of Identification and Naming and Senior Research Leader (Asia) Dr. Tim Utteridge. His love for finding and describing plants is readily apparent. Join us for a fun discussion about what it is like working with tropical Asia's plant life. This episode was produced in part by Brodie, Kevin, Katherina, Sami & Sven, Sophia, Brian, Mark, Rens, Bendix, Irene, Holly, Clifton, Shane, Caitlin, Rosanna, Mary Jane, Manuel, Jennifer, Sara, Sienna & Garth, Troy, Margie, and Laura. Did you know that cycads are the most endangered group of organisms on the planet? We are officially facing a cycad crisis but luckily there are people like Dr. Nathalie Nagalingum from the California Academy of Sciences who have devoted their life to understanding and protecting these so-called living fossils. This episode was produced in part by Rens, Bendix, Irene, Holly, Clifton, Shane, Caitilin, Rosanna, Mary Jane, Manuel, Jennifer, Sara, Sienna & Garth, Troy, Margie, and Laura. Who doesn't love oaks? This episode is all about their evolutionary origins. Joining us is a powerhouse team of scientists - Dr. Jeannine Cavender-Bares, Dr. Andrew Hipp, and Dr. Paul Manos - whose work has changed the oak origin story in a very interesting way. We also discuss what this means for oak conservation around the globe. If you love oaks, this is one episode you don't want to miss! This episode was produced in part by Allan, Irene, Clifton, Sebastian, Holly, Katherina, Shane, Amy, Caitlin, Rosanna, Mary Jane, Jennifer, Sarah, Christopher, Sienna & Garth, Troy, Margie, Laura, and Mark. Check out the paper by clicking here! This episode is all about the passion flower family - Passifloraceae. Joining us from her post at the Royal Botanical Gardens at Kew is the one and only Rebecca Hilgenhof. You may remember her from Episode 86. Rebecca is extremely passionate about this group and I can't think of a better person to dish out an eloquent introduction to these wonderful plants. This episode was produced in part by Allan, Irene, Clifton, Sebastian, Holly, Katherina, Shane, Amy, Caitlin, Rosanna, Mary Jane, Jennifer, Sarah, Christopher, Sienna & Garth, Troy, Margie, Laura, and Mark. I can't think of a gardener with a better sense of humor than Peter Donegan. Peter not only owns and operates an award-winning landscape design company, he is also the host of the wonderful horticulture podcast The SodShow. Join us as we wax poetic about our mutual love for growing plants and our journey through the world of podcasting. This episode was produced in part by Allan, Clifton, Sebastian, Holly, Katherina, Shane, Amy, Caitlin, Rosanna, Mary Jane, Jennifer, Sarah, Christopher, Sienna & Garth, Troy, Margie, Laura, and Mark. Today we are joined by John Magee, landscape designer and co-host of The Native Plant Podcast. John has always been a fan of gardening with natives and has some wonderful insights about the culture of landscaping. Join us for a fun discussion centered around celebrating native flora. This episode was produced in part by Allan, Clifton, Sebastian, Holly, Katherina, Shane, Amy, Caitlin, Rosanna, Mary Jane, Jennifer, Sarah, Christopher, Sienna & Garth, Troy, Margie, Laura, and Mark. The title says it all. My guest today is Amy Hruska, a PhD student at the University of Hawai'i. Her research bridges the gaps between invasive species, extinction, and seed dispersal in Hawaiian forests. Join us for an enlightening discussion about where a botanist fits in to this system. This episode was produced in part by Allan, Clifton, Holly, Katherina, Shane, Amy, Caitlin, Rosanna, Mary Jane, Jennifer, Sarah, Christopher, Sienna & Garth, Troy, Margie, Laura, and Mark. Carlos Magdalena has been called "The Plant Messiah" for good reason. His propagation work at the Royal Botanical Gardens at Kew has seen species like Nymphaea thermarum (the world's smallest water lily) and the Café Marron (Ramosmania rodriguesii) back from the brink of extinction. Join me for a discussion with this plant whisperer. This episode was produced in part by Allan, Clifton, Holly, Katherina, Shane, Amy, Caitlin, Rosanna, Mary Jane, Jennifer, Sarah, Christopher, Sienna & Garth, Troy, Margie, Laura, and Mark. Many of us are aware that planting legumes helps enrich soils but how do they do this? By partnering with bacteria, of course! My guest today studies how this mutualistic relationship evolved and how it is maintained throughout various lineages. Dr. Katy Heath is a plant person at heart and she brings that passion with her to her lab as she tries to understand these evolutionary processes. Join us for a fascinating discussion about this system. This episode was produced in part by Allan, Clifton, Katherina, Shane, Amy, Caitlin, Rosanna, Mary Jane, Manuel, Jennifer, Sara, Christopher, Sienna and Garth, Margie, Laura, and Mark. The 'Ohi'a (Metrosideros polymorpha) is the dominant tree on the Hawai'ian Archipelago and it is under attack by two different species of invasive fungi. Trying to understand and combat the spread of these pathogens is one of the main focuses of our guest, Dr. James B. Friday. Together with multiple different stakeholders, they are trying to understand how these fungi got to the island and what can be done to protect Hawai'i's most famous tree. Allan, Shane, Amy, Caitlin, Rosanna, Mary Jane, Manuel, Jennifer, Sara, Christopher, Sienna and Garth, Margie, Laura, and Mark. Our guest today is Dr. Karl Niklas. His work utilizes mathematics to explain plant growth and form in relation to four basic physical constraints: 1) Plants have to capture sunlight and avoid shading their own leaves, 2) Plants have to support themselves structurally, 3) Plants have to conduct water to their various tissues, and 4) Plants must be able to reproduce effectively. Using these basic constraints, Dr. Niklas builds mathematical simulations of plant evolution. Join us for a fascinating dive into the biophysical world of plant evolution. This episode was produced in part by Allan, Shane, Amy, Caitlin, Rosanna, Daniel, Mary Jane, Manuel, Jennifer, Sara, Christopher, Sienna and Garth, Margie, Laura, and Mark. I am back in Illinois and I met up with my good friend Steve (co-host of The Field Guides Podcast) to wax poetic about summer botanizing. Steve has spent most of his summer exploring Illinois while I have been busying myself in the southern Appalachian Mountains. We bring a lot of interesting species to the table in this episode, each with its own memorable experience. This episode was produced in part by Allan, Amy, Caitlin, Rosanna, Daniel, Mary Jane, Manuel, Jennifer, Sara, Christopher, Sienna and Garth, Margie, Laura, and Mark. For Dr. James Costa, a love of biology started early. It eventually evolved into a career studying social insects and their interactions with plants. It also evolved into a passion for the history of science, specifically that of evolutionary theory. Dr. Costa wears many hats and you will hear about some of them in part one of this two part episode! This episode was produced in part by Allan, Amy, Caitlin, Rosanna, Daniel, Mary Jane, Manuel, Jennifer, Sara, Christopher, Sienna and Garth, Margie, Laura, and Mark. 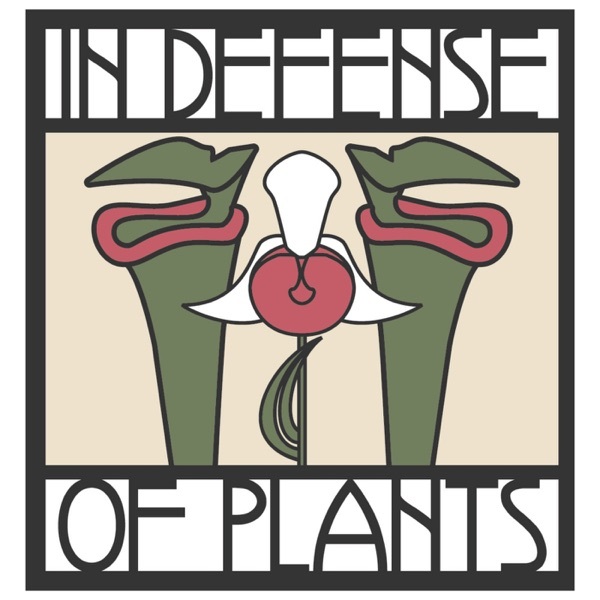 In this episode, In Defense of Plants is going back in time a bit to my visit to San Francisco. What you are about to hear is a tour of Tilden Park's wonderful botanical garden whose purpose is the collection, growth, display, and preservation of the native plants of California. This was easily one of the most impressive living collections I have ever seen. The tour was led by none other than Bart O'Brien, who has been placed in charge of this amazing place. If you head on over to www.indefenseofplants.com/podcast you can find the photo album that accompanies this trip. This episode was produced in part by Mark, Allen, Desiree, Sienna & Garth, Laura, Margie, Troy, Sara, Jennifer, Christopher, Manuel, Daniel, John, Rosanna, Mary Jane, Amy, and Caitlin. You have all probably seen them, however, many probably don't realize what they are. Leaf miners are any sort of arthropod that lives part or all of its life nestled in the tissues of a leaf. This is an amazing world that desperately need more attention. That's where people like Charley Eiseman come in. Charley has devoted much of his free time to trying to better understand the leaf miners of North America. Along the way he has made some exciting discoveries, describing new species in his own back yard! Join us for a riveting about the micro world. This episode was produced in part by Mark, Allen, Desiree, Sienna & Garth, Laura, Margie, Troy, Sara, Jennifer, Christopher, Manuel, Daniel, John, Rosanna, and Mary Jane.